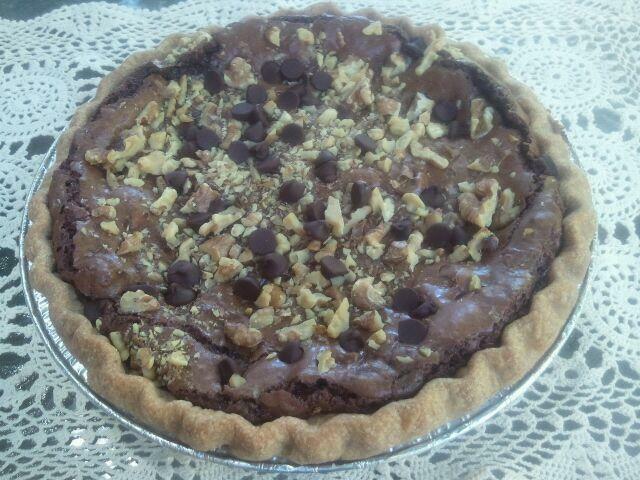 Brownie Pie – Though this is not Ellen’s pie hers looked just like this one! A few weeks ago, our friends Ellen and Christoph were supposed to pay us a visit. As it turns out, something came up and they were not able to make it. My husband and I were both sad to hear that they were canceling their trip because it had been quite some time since we’d seen them. We met Ellen and Christoph about twenty years ago when my husband worked for an accounting firm in Portland. I think the first time we saw them it was at the company Christmas party and we were seated at the same table. Ellen is smart and has a dry sense of humor and I liked her right away. We did not see each other very often because we were all so busy – working, raising children, etc. When we moved away from Portland about sixteen years ago, Ellen and Christoph made it a point to keep in touch and occasionally have make the journey south to Ashland. We are always delighted to seem them and enjoy spending time catching up. Because they were not able to come visit, I wanted to send a brownie pie to Portland (actually they live in Beaverton) to let them know that we miss them and look forward to seeing them again soon. My hope is that this gesture will bring a smile to their faces and remind them that they are never far from our thoughts. ← Day 142: Lechi and Nathan and Pretty toes! I hope Christoph enjoys the pie. He works tirelessly to help health care financial managers to become certified and he deserves a piece of pie. If I knew how to bake pies, I would bake one for him, too.